All London stairlifts have safety sensors on the power pack and footplate; these are designed to stop the lift if it meets any obstruction. Once stopped it can only be moved in the opposite direction to the obstruction. All London stairlifts have a diagnostic display so that you can monitor the status of your stairlift, e.g. a safety edge has been activated. 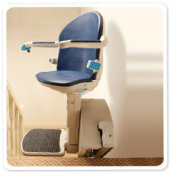 Your stairlift will also come with a seat belt as standard for additional peace of mind. 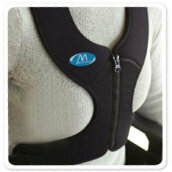 Our easy release retractable seat belt gives the added flexibility of allowing you to fasten it to one side or centrally, whichever is easier for you or other users. 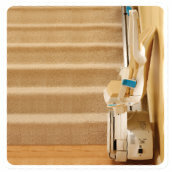 All stairlifts are operated by pressing or holding the large, robust toggle switch in the direction of travel.Located at the end of the seat arm it can be easily operated by the hand or arm and leaves the arm rest clear to provide unhindered support when getting on or off the seat. All London stairlifts come with two remote controls as standard, so you can have one upstairs and one downstairs. 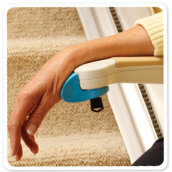 This means you can send your stairlift up and down the track without having to sit on it. This not only allows you to park at the top or bottom of the stairs, it is ideal for multi-user situations as your stairlift can be called between levels, just like an elevator. Lifted and lowered by hand, manual footplates are fitted with an easy fold mechanism that minimises the strength required to fold the footplate up or down. If you choose the powered footplate option it will remove the need for you to bend down to fold or unfold the footplate. You can choose to have a footplate that folds automatically when the seat is folded and unfolded, or that is operated separately to the seat by a switch in the seat arm so you can raise and lower the footplate whilst seated.